It's Such a Sweet Sensation to Play This Fruit-tastic Slot! When you're seeking out a fruit-filled slot the looks and sounds like a million bucks, then it's time to check out Fruit Sensation. Against a dark backdrop, these classic slot symbols take centre stage and entice players to keep spinning those reels. Click the green start button at the bottom right side of the screen and see what happens as the fun music begins to crank up and your favourite symbols dance on the screen. In this Novomatic casino game, you will have ten perfect paylines to help you achieve your ultimate goals. Make the most out of them! Although there is no shortage of fruit-themed casino games out there in the world, this one is sure to knock your socks off. Ideal for fans of Fruits n Royals, Fruits n Sevens, Happy Fruits, Fruit Drops, Fruit Fortune and Fruit Fest, this aesthetically pleasing amusement provides the perfect way to spend an evening—or even just a few minutes before work. For those who are curious about how the different symbols pay out, all you need to do is click on the paytable to discover the most spectacular symbols. The number seven reigns as the most generous icon, while bells and watermelons follow closely behind. However, you will not want to ignore the lemons, plums, oranges and cherries. Anytime you score enough of these symbols, you are sure to feel some positive vibes! Hit Autoplay and See What Kind of Sensations Pop Up! 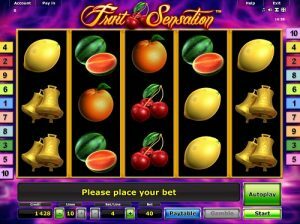 Fruit serves as the perfect symbol for a slot game. Although it is sweet, it is also good for you. The same could be said of Fruit Sensation, which also boasts outstanding music and sound effects. If you happen to win, you will immediately know that something good has happened! Not only will the symbols spin around, but you'll also hear some groovy sounds. There is no way to mistake the celebration mode in this glamorous game. Slots Aficionado? New Player? Jump in the Fruit Bowl! When you're playing Fruit Sensation, chances are that you will immediately be struck by how easy it is to pick up this game. With all sorts of options to customize the slot to your distinct specifications, it truly is a marvel of sorts. This game has five reels of fun awaiting and you will immediately become entranced by all of the amazing artwork and sassy sounds. If you happen to be lucky enough to score some wins, then you will notice that the Gamble feature becomes available to you. Place your wager on red or black, and you will immediately have the opportunity to see which of these playing card symbols won this time. Click on this icon and you'll have the chance to bump up your winnings even more—talk about a sweet surprise! With a background that is enrobed in pristine purple, Fruit Sensation is out to prove that getting your daily servings of fruit is important for everyone. Calling to mind simpler times, this slot game offers the ultimate in relaxation in fun. It takes you back to the earlier, more glamorous days of the casino, when men and women roamed around in their finest attire. Luckily for you, this kind of glamour will be made available to you in the comfort of your own home. With the fantastic way in which Fruit Sensation is structured, those who like to bet big may find that they are amply rewarded if they do happen to get some luck going in their direction. The simple and spectacular way in which this game is organized makes it easy to understand. With every turn of the reels, you will revel in the aesthetic pleasure that this game provides. No Extra Bells and Whistles—but Lots of Bells and Cherries! Fruit Sensation has no unnecessary features —and all of the options that you desperately crave! With an appeal (or a peel!) that entices all kinds of players, this fruity blend is perfect for everyone. It doesn't matter if you normally play games such as Book of Ra Deluxe, Dr. Enlarge O, Mega Joker or Cupid's Arrow; Fruit Sensation is bound to get you going in ways you never imagined before. All you need to do is click the start button and then embark on the sweetest and most divine, fruity adventure of all time.